The bridge is not only beautiful, and massively over-engineered, but also is an impressive multitasker; trains, buses, general traffic, pedestrians, people on bikes. All catered for. It is its multi-modality that makes it truly impressive, some 73% of the people entering Sydney on the Bridge from the Shore at this time are doing so on just one of the train lines and one bus lane; a fraction of the width of the whole structure. So not only does it shame our Harbour bridge aesthetically it completely kills it for efficiency too. In 1992 it was supplemented by a pair of two lane road tunnels that up the cross harbour tally for this mode to match the number coming over by train [bridge plus tunnels = 12 traffic lanes], but that wasn’t done until the population of the city had hit 3.7 million. The high capacity systems on the bridge saved the people of Sydney and Australia from spending huge sums on additional crossings and delayed the date they were deemed necessary by many decades. But anyway, because the additional crossing is just road lanes it only adds around 10% extra capacity to the bridge. To think that the government here and NZTA are seriously proposing to spend multiple billions in building a third Harbour Crossing in Auckland with the population only at 1.5m, but not only that but they are planning to build more capacity for the least efficient mode; more traffic lanes. Excellent, always great to invest in systems that take unnecessary traffic away. And there is no better way to achieve this than to make the alternatives to driving so much quicker and more reliable with dedicated right-of-ways. Here is the perfect opportunity to achieve that, the opening of the WRR should be paralleled by the addition of bus lanes right across the Bridge in order to lift its overall capacity. And at the same time perhaps truck priority lanes on the sturdier central lanes should also be considered, so the most important roles of highways, moving people and freight efficiently, can be more certainly achieved. Although the need for that depends on exactly how much freight traffic shifts to the new route [as well as the rail line and trans-shipping via Northland’s new cranes: ‘New crane means fewer trucks on the highway’]. Outside of the temporary blip caused by the building of Puhoi to Warkworth [much which will be able to use the WRR] heavy traffic growth on the bridge looks like it is predominantly buses. Perfectly argued Patrick, the kind of thing the Minister should really be reading as he eats his breakfast Wheaties. Or whatever it is he eats for breakfast – some speculate that it might be toast. He eats Green Berets? I don’t geddit. Arnold Schwarzenegger quote from the movie ‘Commando’. Ah. I really must watch that film, I’ve only seen the first 15 minutes for some reason. To be fair it really doesn’t work on the Brooklyn Bridge, but that’s largely due to the sheer number of tourists and their standing in the bike lane to take photos. It’s extremely popular with tourists on Citi Bikes, not so much with New Yorkers, especially in the evening. The Manhattan Bridge, which is within half a mile of the Brooklyn Bridge at both ends, has a physically separated bike lane and carries roughly double the cycle traffic. Gus I agree, whereever possible it’s better to separate riders and walkers, but I have been that tourist on the Brooklyn Bridge and it simply means the cyclists and skateboarders have to slow down and they do. But 1.5m Aucklanders versus how many million New Yorkers? I think we’ll cope. The key to shared paths is width, and a bit of marking helps. The viewing build outs on SkyPath are a great way of reducing conflicts between static viewers and impatient movers. And the view is great, and will be even greater if we get round to building something wonderful on the end of Wynyard wharf…. If it’s crazy busy we’ll just have to build another one on the other side and deliver separation, but for now one route will surely be fine. Totally agree with you on Auckland. Was purely offering my opinion on the Brooklyn Bridge’s bike lane as someone who regularly goes out of the way to avoid it! The Brooklyn Bridge is horrible for cycling. It’s a crush of idiot tourists (pedestrians). Still better than being in the traffic tho. The cycling figures for Sydney bridge are correct yet for a city with a population many times bigger than ours with better weather how do the expected Skypath figures add up? Traffic modelling for any mode seems to be broken these days, I think we have to wait and see. One good thing about the crazy plan to charge to use the bridge under your own power is that offers a means to restrict or encourage traffic by altering the price. Anyway the SkyPath catastrophists can’t seem to make up their minds what they are panicking about: a stampede or a trickle? Total city population is not a relevant comparison because people beyond a certain distance are not in the market for riding a bike across the bridge at all. The relevant comparison is population and workplaces within a certain distance of the bridge. Sure, but total is a good enough proxy; Manhattan and Brooklyn are way denser than AKuckland. Great and well argued post Patrick. The policy makers really have to take note of this. And because Sydney is so close and most NZers have been there it is easy for us to confirm the veracity of the post. The extraordinary emphasis by policy makers (and especially the two previous Ministers of Transport) on expediting the single transport mode of the motor car for Auckland could be considered laughable were it not for the enormous misapplication of taxpayer funds over the period. We are promised congestion relieved travel with each widening of the motorway etc. and of course it just doesn’t happen – no matter how much is spent. My personal view is that continued expenditure in the poorly focused roading mode is almost criminal and NZTA funding needs to be almost totally centred on public transit for the next 10 years. A pair of 24×7 bus lanes is a no-brainer IMO. When the Western Ring Route opens add a toll for trucks over the bridge – there really isn’t much reason for them to use the bridge unless their destination is Takapuna or similar. These two fixes would cost next to nothing and should allow us to use just the current bridge for another 20+ years. And why don’t we paint our bridge and add lights to it? Surely it could look more like a feature than it currently does. lipstick on a pig comes to mind, but I’m sure we could improve its appearance. (I like pigs). My earlier thoughts, but these days I say lets bowl it (or maybe mothball) and build an new bridge that does everything (motorway, local lanes, rail, cycling, walking). Old cost estimates here: http://www.nzta.govt.nz/assets/projects/awhc/docs/form-assessment-study-report/awhc-fasr-appendix-h-confirmed-form-option-cost-estimates.pdf Bridge at $3.9b vs $5.3b for the tunnel. I’m quite keen on the idea of a double deck bridge (common in Asia and North America) to replace the existing one on a straighter alignment. Six or eight lanes of motorway on the lower level, four lanes for city traffic plus light rail, walking and cycling on the upper level. Could the existing bridge take light rail at some point? This is the current plan of many at AT and NZTA. But to achieve this they want to blow 6 billion on an adjacent route for the traffic. This is a poor plan in my view; why build two massive road tunnels and two huge interchanges at each end in order to get more Transit capacity? Surely the better solution is to simply leave the traffic bridge for the rubber wheeled vehicles it was designed for and build the missing high capacity Rapid Transit route from scratch under th harbour. It will be considerably cheaper, less disruptive, and lead to a better higher capacity outcome. Yes, absolutely – we need much better efficiency in the expending of our taxpayer dollars than we are currently getting. Or even lower cost (and better than a tunnel?).. just keep the old bridge as it is (but with bus lanes) and build a new rail / cycle / walking bridge from Hamer St to Sulphur Beach Road. Run the tracks alongside SeaPath to the busway, job done. Valid points and well presented Patrick. As others have said, it is exactly the message that our government ministers need to be hearing and heeding. But unfortunately it seems that said government ministers are uninterested and unreceptive to facts and well-reasoned arguments that challenge their favoured decisions. Ministers suffer from an all-too-common failing among modern managers: An arrogant belief that they are always right and an inability to accept that alternative ideas of others may be better. The only way to break through this arrogance is for the court of public-opinion to judge these people, find them wanting and vote (or shame) them out of office. And for this to happen, the message exposing their incompetence needs to be broadcast as widely as possible. Keep doing what you’re doing Transport Bloggers! Yes I agree our current bridge should be dismantled with a new cable stay bridge built in a much more direct path, and with the ability to handle heavy rail and cycling. My question is why is it that Auckland always gets downgraded projects to the point they might as well not get built at all. And why did they think it was OK to build a bridge as steep as our current one, When a town across the ditch had set the standard 20 years earlier. Any arguments for dismantling the current bridge play into the hands of the traffic lane duplicators; what do we do while the old bridge is down and before a replacement is up? In other words I don’t see this idea as practical. We have an ugly but currently functional bridge with a great deal of sunk investment. Keep it, work it hard, and add the missing high capacity next route. Then we can start adjusting the old bridge; rebuild the clip-ons or whatever. Either way it is the most cost effective, highest capacity, and least disruptive option. Something to do with large ship access up the harbour I think. No, buses are best for the bridge, and there’s plenty of capacity in the Busway yet, although not so much in the city. The bridge is built for traffic, if we want the advantages of rail we need to build a rail crossing. And that is the next major build we should be planning for. Meantime maximise the benefit of the huge investment in the WRR by improving the capacity and efficiency of the bridge with buslanes. Why waste extra money on a tunnel when we could just build the NS rail on the bridge though. Wouldn’t it be better so that we can use the savings for other PT projects. No because there really is no room on the bridge to add rail. So it isn’t a waste to add additional rail crossing when the time is right. Which is to say when the buses are heading towards infarction on city streets. There is also the resilience aspect that an additional crossing does add, whatever the mode. But the politicians and managers in charge *don’t want* bus lanes. Simple as that. Doesn’t matter if they are a good idea, highly efficient, cost-effective or whatever. There is a policy-roadblock and it is these people causing it. No so anymore in Auckland Dave, we are getting them all over the place even without us making a fuss! There has been a policy change, and perhaps some old traffic engineers have died off, either way, they are finally happening, and drivers are even getting used to them, which has happened more quickly that I thought they would. No help from the Herald of course. The best thing to do is to keep presenting evidence and examples, and an excuse for them to have another look [WRR] and you never know…. True, over Auckland at large. But I was just referring to the Harbour Bridge. Those in charge seem opposed to bus lanes happening there, regardless of demonstrable benefits and clear justification..
Oh, yes quite right, thus far. The WRR does change things significantly, however. Unless of course they don’t believe their own arguments for doing it in the first place….? I’m aware they made it steep to allow ships to and from the sugar refinery, but they cut corners. For a bridge to have hight or clearance it must have span. 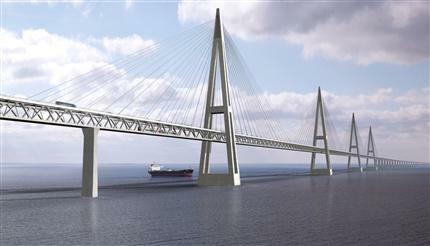 They found the narrowest part of the harbour and built the tallest bridge. Yes Auckland was a small town back then and it was only a quick easy way to get cars to the shore. They believed people on foot would continue using the fairy. But should we keep living with our small town bridge? Nzta want to spend 6 billion on tunnels. But That would build a nice bridge. And obviously a new one can be built with the old one in place. Actually they started with a broad bridge of six lanes with two nine foot wide footpaths, one either side, and a tall arch. The fully expected people to want to walk across, and designed it accordingly. However in the late 1940s Auckland wasn’t very big and couldn’t afford the mega project, and the bridge got scaled back to be cheaper. The cut the footpaths, the number of lanes and the width of the lanes. They also reduced the tall arch to the flat one we have today, to save on steel. I had a go once at comparing the cost of the harbour bridge when built to the regional GDP at the time. As a proportion, the original bridge plan worked out to the equivalent of us spending nine billion dollars today. The revise scheme trimmed that to the equivalent of about five billion. It’s not a precise assessment, but it does point out that the bridge was hugely expensive. Agreed, 6 billion today would build a very nice bridge. The Sydney Harbour Bridge as originally designed and built actually had provision for two pairs of train tracks on both the eastern and western sides. The eastern pair of tracks were for proposed lines to Newport and Northbridge. These tracks were used by trams when the bridge opened. After WW2 rail building plans were scaled back and with the scrapping of the trams the tracks were converted to roadway. So as-built the bridge had the capacity to carry twice as many train passengers. Interestingly they are now going to spend billions on a second rail crossing using a new tunnel for the Sydney Metro despite the current bridge being future proofed for a second train line. MarkB the bridge might have been future proofed, but nothing else was. They allowed buildings to penetrate the easement for the underground railway south of the bridge. Now the railway must follow a different route. They made no allowance for the line to be able to go north of North Sydney, which was because they assumed it would go off to DeeWhy or somewhere, not continue up the North Shore.